After I failed at my first attempt to see them, I was back again to Derawan Islands few months later with my other group of friends. After being told that the best time to go to Derawan Islands is when there is no full moon, so with some helps from online moon calendar, I chose the date that so-called not a full moon period. Not so sure that time, but yeah, I decided the date. On our last day in Derawan Island, we departed early in the morning, around 5 am, to Talisayan for the Whale Shark spotting and then to Biduk-Biduk where we would spend our last night at before going back to Jakarta. Biduk-Biduk is also where the crystal clear Labuan Cermin Lake is. We were told that there was a new spot – a new bagan that was stationed not far from Derawan Island, and it had been reported that there were two Whale Shark seen the day before. We decided to give that spot a shot, if nothing found, then we would continue to try our luck at Talisayan. The sky was still dark when we left Derawan Island by boat that morning. I didn’t know what others had in their mind that time. As for me, I was a little nervous but excited at the same time, wondering whether I would have the luck to see this largest fish in the ocean this time. About 30 minutes later, we reached the bagan that we were told before. No other boats around, only ours. I saw one or two fishermen were throwing the fish down to the sea. They kept throwing in and all of us were in silence watching over the sea water. Bagan is a floating fishing platform made from wood which connected to a boat. The fishermen would throw small fish to the sea around the bagan every morning to feed the Whale Shark. Apparently, Whale Shark is a filter feeder. It feeds on plankton including copepods, krill, fish eggs, and small squid or fish. And based on the information I read online about the fish behaviour, it doesn’t fancy any others besides its usual diet. So, turtles or human, a nay for them. “There it is! There is one coming!” Shout one of the fishermen from the bagan. I couldn’t really see because the sky was still dark but I saw one by one my friends started equipping themselves with their own snorkeling gears and underwater camera. I was hesitated whether to jump in or not as I felt the boat was shaky which means the sea was not calm either. For few seconds I could feel the fear overcame me – fear of the sea and also the fish! I didn’t know how big the Whale Shark would be as I couldn’t see it from the boat. But I tried to calm myself down. Few of my friends didn’t go down. I was the last one from the ‘going in’ group to go down. With my action cam on my right hand and my other hand trying hard to grab on the aluminium stairs that hanging on the side of the boat to stabilize my position inside the water. Until I felt comfortable enough then I let go and swam a little in.. I saw that giant fish. It was near to the bagan, sucking the small fish that being thrown by the fishermen and also plankton around it. I was in between fear and amazed. I started aiming my action cam to record the Whale Shark. Whale Shark has a wide mouth and the one that we saw was considered a smaller size, the big one can be twice its size. Before we left the boat earlier, our guide told us that the Whale Shark usually has tendency to swim near to us, so, don’t be panic. Ok, advice still an advice. The fact was we were all quite panic when it turned around and swam toward us. He also advised us to stay about 2 meters away from its wings and 1 meter from its tail. But the fact was, once we were in the water, all the calculation just seemed not right. Ha..! I stayed in for a while then I went up to the boat and watched the fish from above. The sky was getting brighter and its appearance was easier to be seen by then. It swam in, up and around multiple times. We all enjoyed watching it. The journey to Talisayan was still long, so we made a move not long after that. One more God’s creation in front of me. I was happy. Hope it will still be there in many generations to come. Stay safe, buddy! Till we meet again! 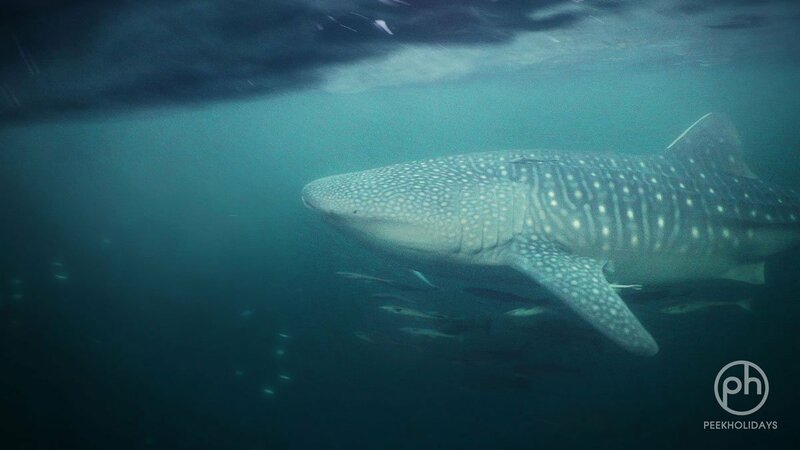 Have you seen Whale Sharks in wild before? Do you feel fear to see this gigantic fish? Let me know what is your thought about Whale Shark on the comment box below.